Umberto Marie Victor Amadeo Joseph di Savoia-Carignano, Principe di Savoia was born on 22 June 1889 at Turin, ItalyG. He was the son of Amadeo I di Savoia-Carignano, Rey de España and Marie Letitia Eugenie Catherine Adelaide Bonaparte, Princesse Napoléon.1 He died on 19 October 1918 at age 29, from wounds received in action. He gained the title of Conte di Salemi. He gained the title of Principe Umberto di Savoia. He fought in the First World War. He gained the title of Duca d'Abruzzi.1 He gained the title of Principe Luigi di Savoia. 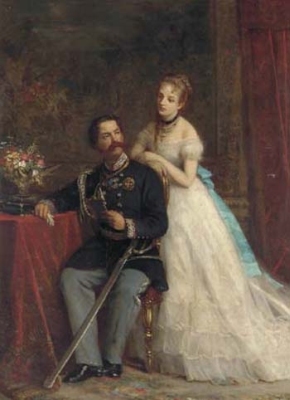 He gained the title of Conte di Torino.1 He gained the title of Principe Vittorio Emanuele di Savoia. Yolanda Marguerite di Savoia-Carignano, Principessa di Carignano was born on 1 June 1901 at Rome, ItalyG.2 She was the daughter of Vittorio Emanuele III di Savoia-Carignano, Re d'Italia and Jelena Petrovic-Njegoš, Princess of Montenegro.1 She married Giorgio Carlo Calvi, Conte di Bergolo on 9 April 1923 at Rome, ItalyG.2 She died on 16 October 1986 at age 85 at Rome, ItalyG. She gained the title of Principessa Yolanda di Savoia. Her married name became Calvi. Giorgio Carlo Calvi, Conte di Bergolo was born on 15 March 1887.2 He married Yolanda Marguerite di Savoia-Carignano, Principessa di Carignano, daughter of Vittorio Emanuele III di Savoia-Carignano, Re d'Italia and Jelena Petrovic-Njegoš, Princess of Montenegro, on 9 April 1923 at Rome, ItalyG.2 He died on 25 February 1977 at age 89 at Rome, ItalyG. Maria Francesca di Savoia-Carignano, Principessa di Savoia was born on 26 December 1914 at Rome, ItalyG.2 She is the daughter of Vittorio Emanuele III di Savoia-Carignano, Re d'Italia and Jelena Petrovic-Njegoš, Princess of Montenegro.1 She married Luigi Carlo di Borbone, Principe di Parma, son of Roberto I di Borbone, Duca di Parma and Maria Antonia Adelaide de Bragança, Infanta de Portugal, on 23 January 1939 at Rome, ItalyG. [S12] C. Arnold McNaughton, The Book of Kings: A Royal Genealogy, in 3 volumes (London, U.K.: Garnstone Press, 1973), volume 1, page 449. Hereinafter cited as The Book of Kings. Maria Luisa Alliaga Gandolfi was born in 1899 at Fossano, ItalyG.1 She was the daughter of Charles Gandolfi, Count of Ricaldone.1 She married Ferdinando di Savoia-Genova, Duca di Genoa, son of Tommaso di Savoia-Genova, 2nd Duca di Genova and Isabella Marie Elisabeth Prinzessin von Bayern, in 1938 at Turin, ItalyG.1 She died in July 1986 at Turin, ItalyG.